When investing into Brett Gardner's problems, one stat really jumps out at you. Gardner, after batting .287 against righties last year, is only batting a .105 against them this year. But even more telling is what Mark Simon found out, in a excellent article on ESPN back in March. 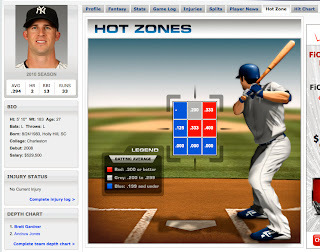 Last year, against righties, before he was hit by a pitch on June 21st, Gardner had an awesome .421 OBP. Afterwards, it dipped to .353. What happened? Well, according to a heat map Simon uses, basically, Gardner stopped hitting the low and away pitch. 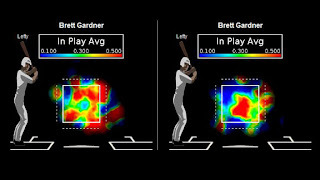 The heat map shows that Gardner, except for the up and in pitch, was pretty effective in more batting zones pre-injury. Post-injury, righties began to throw low and away. And get him out. And that trend has continued. 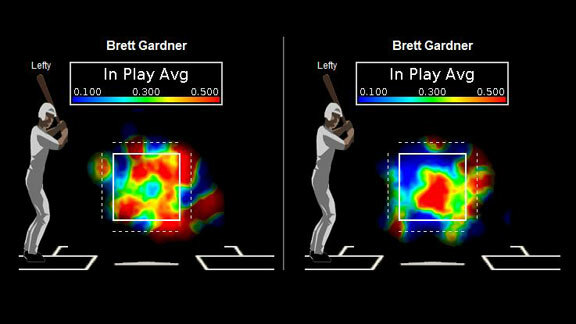 The Fox Sports graphic to the left shows that while Gardner has actually been good this year on the up and in pitches and pitches towards the center of the plate, low pitches and outside pitches have rendered him ice-cold.And pitchers know that. What happened to Gardner when he got injured? Who knows? Whatever it was, it changed his swing, and its still affecting him. Yesterday, Yankee hitting coach Kevin Long said they spotted a mechanical flaw in Gardner's swing. "He is not trying to lift the ball at all, it has more to do with what he is not doing with the lower half," Long said of the ice- cold Gardner, who wasn't in the lineup last night against Rangers lefty Matt Harrison. "He isn't using the lower half. And he is looking at pitches and expanding the zone more than usual. He has been feeling for his swing." "Not trying to lift the ball." "Not using his lower half." That sounds like Gardner couldn't get the low outside pitch because his swing was flat because his legs weren't under him. Hopefully, whatever Long found is the cure. Because the Yankees could use the guy who was batting .321 at the end of June last year, with the .821 OPS. Badly.